Dreamland Beach offers the visitor a beautiful golden sandy beaches, leaned in white limestone cliff. The beach has luxurious clifftop views and perfect place for watching the sunset. The amazing view, power full wave, elegant beachfront, and magnificent sunset on Dreamland Bali are greatly admired by visitors, not to mention the surfers. You can take along with your family to walk around, relaxing, swimming, sunning or just enjoying the tropical sun. Would be a great loss if you miss this coast! Let's take a closer look to this amazing shoreline! In the beginning, around the area of Dreamland Bali is an agricultural area with a thin layer of soil over limestone cliffs and manage by locals. Dry type agricultural by relying on rain to planting the seed. As time goes by, the tourism development impact spreads in to this area. The natural beauty of Dreamland is surrounded by agriculture area being transformed in to luxury resort mega project "Pecatu Graha" by Investor and Government. The mega project was hit by monetary crisis in 1998 and being abandoned. However, the locals need this mega project completed, with the hope to switch from agriculture to tourism businesses. So they named this place as Dreamland, Land of Dreams. Dreamland Beach has a strong wind and powerful waves that greatly admired and most demanded by surfer. Dry season is the best season to surfing in Dreamland. On the dry season, the wind flows from southeast and make a great and powerful wave. Dreamland area is situated in the Ungasan and influenced by D type climate (based on Schmidt-Ferguson climate classification maps) which mean the climate condition is Moderately Climate. Moderate Climate have a humid season which begins from November continues to April. Dry season runs from April to October. Average temperature in Badung Regency range from 22,8 - 32,9 degrees Celsius. Wind speed range from 4,2-8,0 knot (about 4,8-9,2 mph or miles per hours). Humidity range from 77-84 %. The district of Kuta Selatan has high rainfall on the month of December, January, and February. The beach offers an amazing view and magnificent sunset panoramas which greatly admired by visitors. This beautiful beach has luxurious clifftop views. 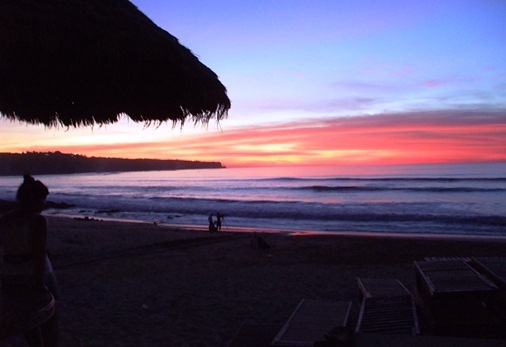 The sunset Dreamland Bali can be enjoyed from this spot with the magnificent beachfront. 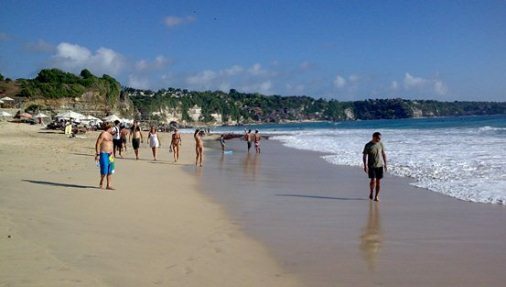 Dreamland Bali has a beautiful golden sandy beaches and leaned in white stone cliff. You can take along with your family to walk around, relaxing, swimming, sun bathing or just enjoying the tropical sun here. This seafront is located in strategic area of Pecatu Graha in Ungasan Village, District of South Kuta, Badung Regency, Bali. The beach is accessible by all vehicle, only 30 minutes from Ngurah Rai Airport. Free entrance fee but you need to pay for car or scooter parking fee. 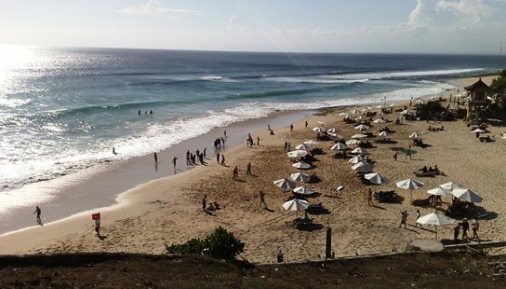 This amazing beach is also close to Uluwatu Beach, Pandawa Beach, Padang-Padang Beach, Balangan Beach and other surfing points such as Suluban Beach, Impossible Beach and Bingin Beach. Garuda Wisanu Kencana (GWK) is located in line with this amazing beach. Take your time to travel to Dreamland Bali, hopefully helpful and thank you!